If you’ve ever gotten stuck messaging friends back and forth just to get the answer to a simple question, a new iPhone and Apple Watch application called Re:quest wants to help. Designed to eliminate circular conversations that seem to go nowhere, Re:quest instead offers a simple way to send a friend a set of answers to a question you pose which they can choose from with just a tap. The messaging client is ideal for use on Apple Watch in particular, as it allows friends to reply with a specific answer without having to dictate that response out loud. Effectively, the app forces the message’s recipient to make a decision by selecting from one of the choices provided, as opposed to engaging in a longer conversation via text about the matter at hand. So, for example, you could ask something like “What sounds good for dinner?,” and offer a list of food choices or cuisines as the possible answers. Or you could ask a significant other when they’re going to be home, and they can pick from answers like “within the hour,” “by dinnertime,” “running late,” or whatever responses you choose to input into the app. The app works well as an iPhone-based mobile messenger with a simple interface that includes an inbox view where you can quickly tap answers to questions and see the answers you’ve received. Plus, you can respond to contact requests and questions with only two options just by left swiping on the notification on the iPhone’s lock screen. However, where the app seems to be most practical is as an alternative to the default messaging app on the Apple Watch. Re:quest is entirely functional from the Watch alone – you can send questions using voice dictation, view past answers, answer incoming questions from notifications, and accept contact requests from friends. 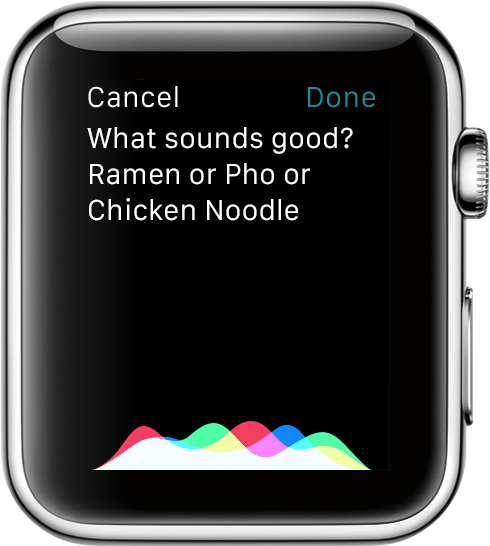 While Apple Watch introduced a way to respond quickly to texts via its “smart replies” feature which are tailored to your conversation (e.g. “can’t talk now,” “not sure,” “yes,” “talk later,” etc. ), Re:quest is faster to use and lets recipients reply to your question with more precise answers. Of course, to enjoy the app, you’ll need to get your friends to join. But the app doesn’t scan your address book – instead, you can send a download link via text or enter in a friend’s “ID” (a code the app provides) to add them on the service. Re:quest was built by the team at MartianCraft, a services studio that has consulted for brands including News Corp, Rhapsody, the Obama campaign, IBM, NASA, AP, and others, and also develops its own apps. Explains MartianCraft managing partner Rob Rhyne, the idea for the app was prompted by a desire to get answers more quickly, without requiring you to pull out your phone. “If you’ve ever tried to nail down a distracted spouse or significant other on where to go after work, this app is for you,” he says. Re:quest is built on Apple’s CloudKit framework which offers a nearly free backend for the service, Rhyne notes, which keeps the monthly operating costs close to zero. And because the company wants to make it easy for anyone to try the app, they’ve made it a free download on the App Store.